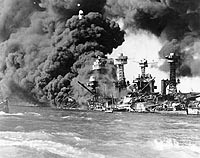 The battleships Tennessee (BB-43) and West Virginia (BB-48) were moored together on "Battleship Row" when the Japanese attacked Pearl Harbor. 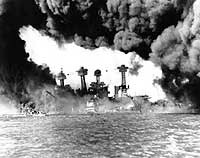 West Virginia was struck by up to nine enemy torpedoes, tearing open her midships and forward hull and wrecking her rudder. She initially listed severely to port, but quick counterflooding by her crew allowed her to settle to the bottom on a relatively even keel. Her Commanding Officer, Captain Mervyn S. Bennion, was one of over a hundred of her officers and men killed in the raid. 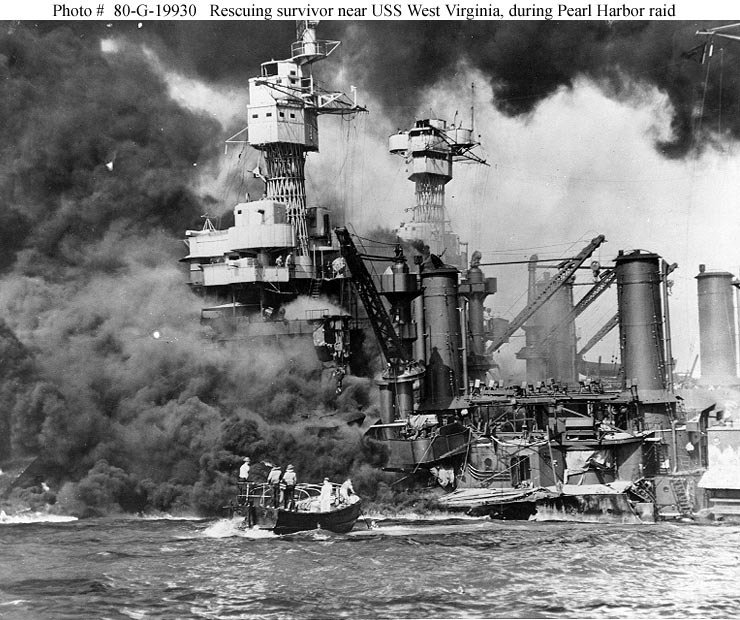 West Virginia, sunk, largely full of water and further damaged by fire and bombs, was subsequently the subject of a massive salvage operation and a very thorough modernization. She did not return to active service until mid-1944. 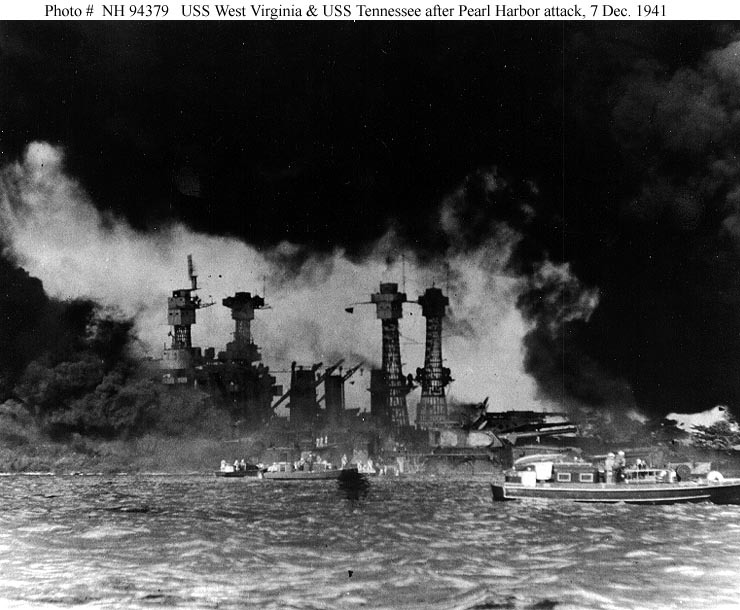 USS Tennessee, the inboard ship of the pair, was hit by two bombs, which disabled her second and third 14" gun turrets but caused no further serious damage. 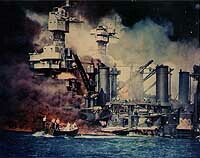 She was set afire in several places by burning debris when USS Arizona , moored just astern, exploded. Her hull plates were also damaged by oil fires. Tennessee was wedged tightly between the sunken West Virginia and her mooring quay and had to be blasted free. 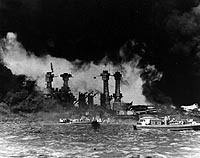 She was given initial repairs at Pearl Harbor Navy Yard and steamed to the west coast for further work later in December. 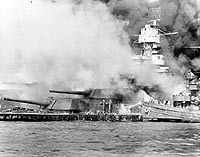 Five of her crew were killed in the attack. This page features views of USS West Virginia and USS Tennessee on 7 December 1941, and provides a link to images taken after that date. 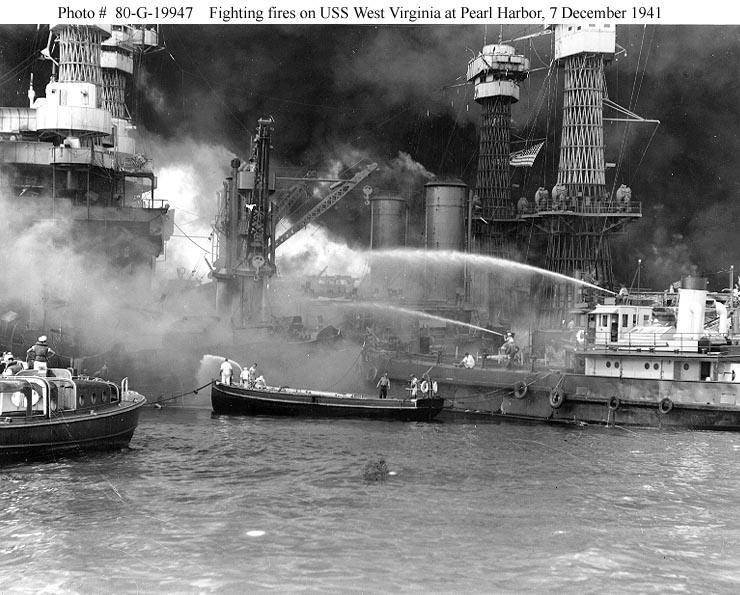 USS West Virginia and USS Tennessee after 7 December 1941. Cook Third Class Doris Miller. Battleships West Virginia (BB-48) (sunken at left) and Tennessee (BB-43) shrouded in smoke following the Japanese air raid. Courtesy of the U.S. Naval Institute Photograph Collection. 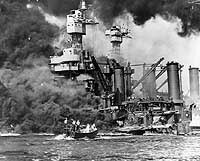 USS West Virginia (BB-48) afire forward, immediately after the Japanese air attack. USS Tennessee (BB-43) is on the sunken battleship's opposite side. 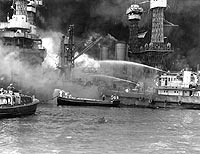 Small craft standing by West Virginia (BB-48) as burning oil drifts past the sunken battleship, shortly after the end of the Japanese air raid. USS Tennessee (BB-43) is moored on West Virginia's starboard side. Both ships are shrouded in smoke from the burning USS Arizona (BB-39), out of view to the right. Sailors in a motor launch rescue a survivor from the water alongside the sunken USS West Virginia (BB-48) during or shortly after the Japanese air raid on Pearl Harbor. USS Tennessee (BB-43) is inboard of the sunken battleship. 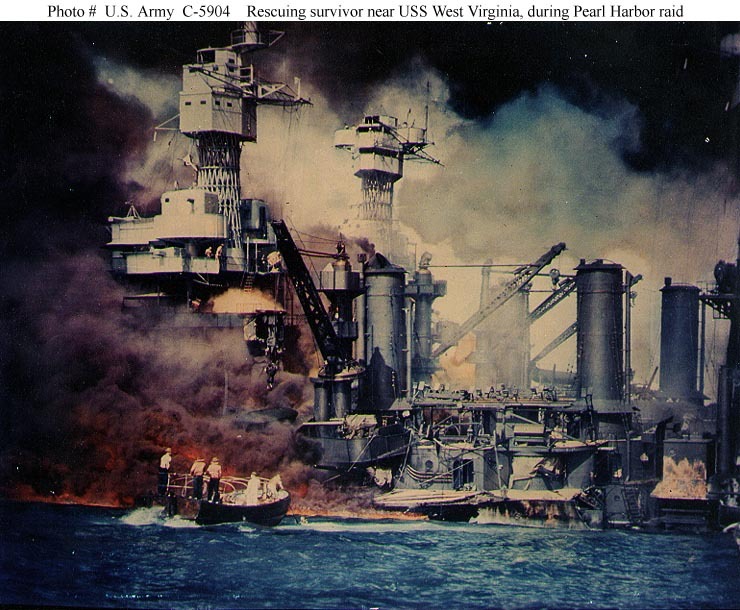 Note extensive distortion of West Virginia's lower midships superstructure, caused by torpedoes that exploded below that location. 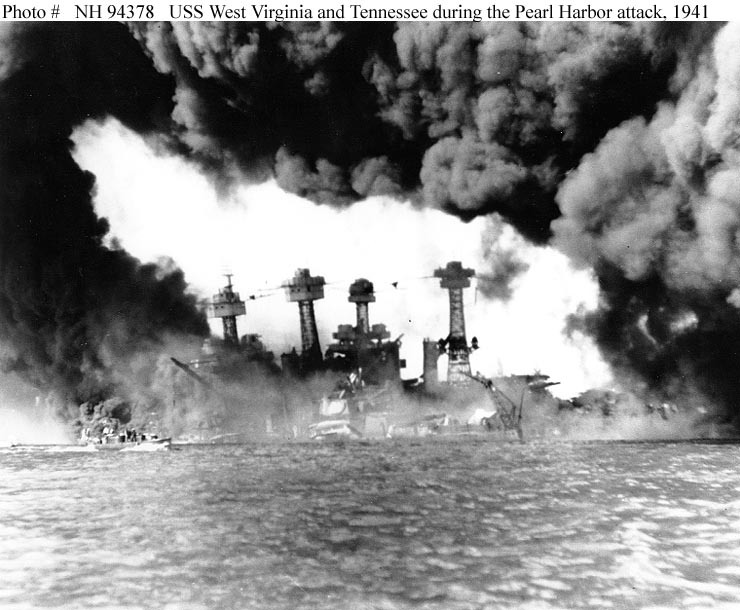 Also note 5"/25 gun, still partially covered with canvas, boat crane swung outboard and empty boat cradles near the smokestacks, and base of radar antenna atop West Virginia's foremast. Note: This is a color-tinted version of Photo # 80-G-19930. It is not an actual color photograph. 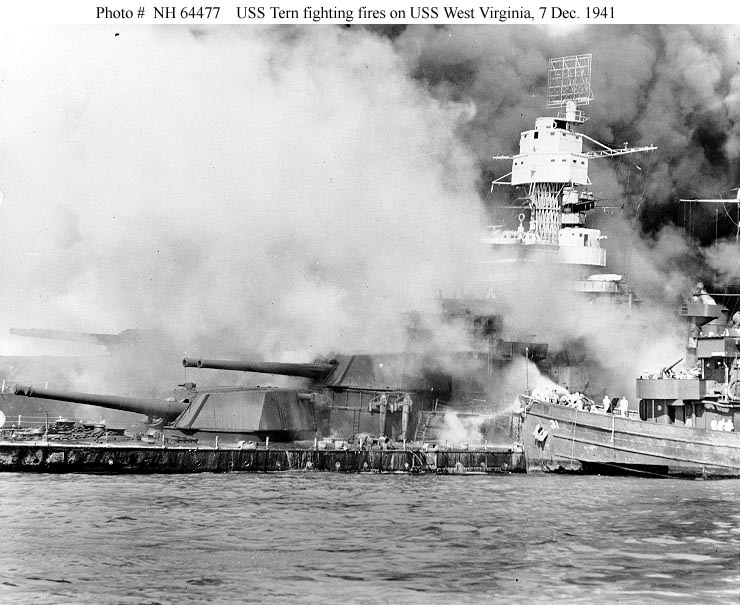 USS Tern (AM-31) fighting fires aboard the sunken USS West Virginia (BB-48), on 7 December 1941, immediately after the Japanese raid. Note radar antenna, paravanes and 16"/45 twin gun turrets on the battleship. 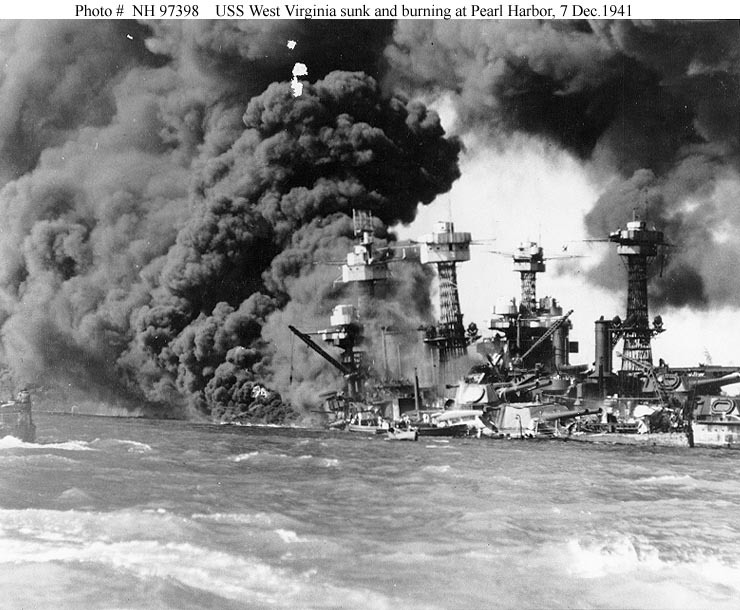 Fighting fires on the sunken battleship West Virginia (BB-48), 7 December 1941. The garbage lighter YG-17 is at right, with her crewmen playing two fire hoses at the flames. Assisting or standing by are a motor launch and an officer's motorboat. USS Tennessee (BB-48) is inboard of West Virginia.